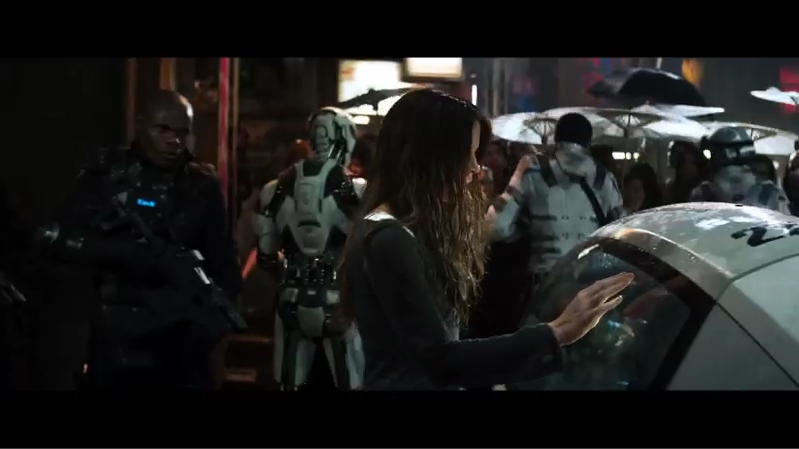 Lori Quaid (Kate Beckinsale) touching the side glazing of the Police MonoTracer in Total Recall 2012 to enable a “FaceTime” video call with her boss Cohaagen (Bryan Cranston). MonoTracer pilot and owner Justin Clarke plays a Police Officer extra with helmet in the right of this scene. Lori Quaid (Kate Beckinsale) makes a MonoTracer MTI-1200 side glazing enabled “FaceTime” hand embedded cellular video call with her boss Cohaagen. The always futuristic MonoTracer enjoys its first big screen debut in Len Wiseman‘s new action packed Total Recall 2012 starring Colin Farell and the talented & gorgeous superstar actresses Kate Beckinsale and Jessica Biel. This film is a remake of Paul Verhoeven‘s original 1990’s Total Recall (starring Arnold Schwarzenegger and Sharon Stone) but with its own variations on the plot, setting, and technologies. Visit the Total Recall 2012 movie website WelcomeToRecall.com and go see the movie while it is still playing in the theaters! I had the opportunity to see the film in AMC ETX splendor last night and counted five MonoTracer sightings. Three of them are at the start of the movie with the last 2 towards the end and closing scene. MonoTracer pilot and owner Justin Clarke provided his own new MonoTracer MTI-1200 and days of support over a few weeks of shooting up in Canada last August 2011. Justin also plays an extra in the film suited up as one of the police officers (see photo above). 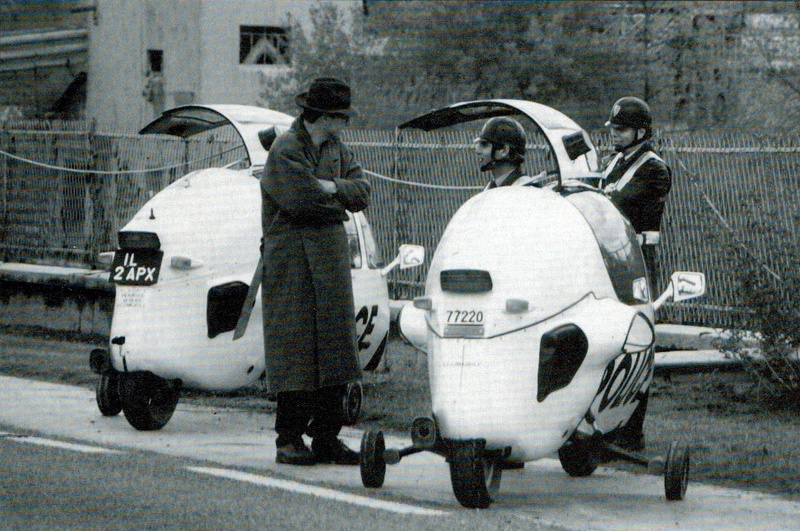 His MonoTracer was stickered up as a futuristic Police vehicle. 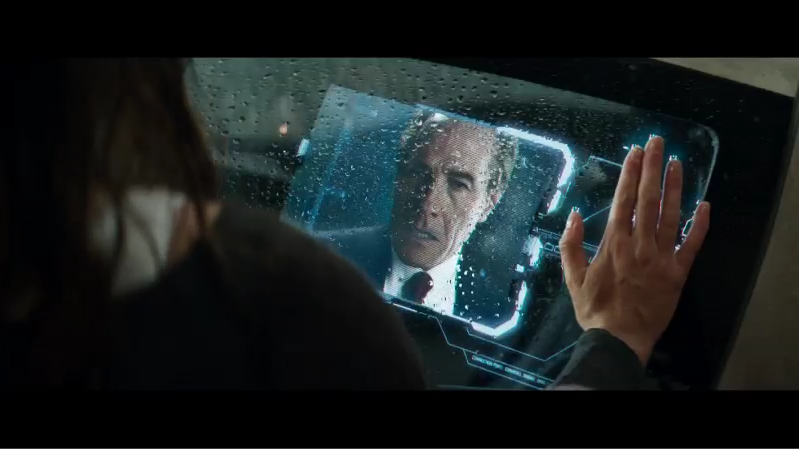 You can see a glimpse of the MonoTracer with Lori Quaid (Kate Beckinsale) enabling a “FaceTime” video call with her boss Cohaagen on the side glazing via the touch of her hand embedded cellular phone at minute 2:06 of in the Total Recall 2012 Trailer #2. The last time a Peraves Cabin Motorcycle debuted on the big screen was 21 years ago in Wim Wenders‘ 1991 action film Until the End of the World with a couple of EcoMobiles outfitted in Police trim. Click here for the official Until the End of the World website. Click here for the Until the End of the World wiki entry. The Until the End of the World trailer is below (Police Ecos not shown). Below are two photos scanned from the 8th issue of Einspur-Zeitung, a “Single-Track Newspaper” published by Peraves AG back in February 1991. The photos were captioned with the following: The pictures show ECO’s No. 5007 and 5010 in action for the French Police. Actually the scene runs in 1999, it’s in the shooting of the Wim-Wenders-movie “Until the End of the World” and by looking at the pictures carefully one recognizes the “policemen” Wolfgang WALTL, ECO-importer for Austria, and Jan HIRSCH, manager of the ECOMOBILE GmbH Germany, controlling star actor William HURT. 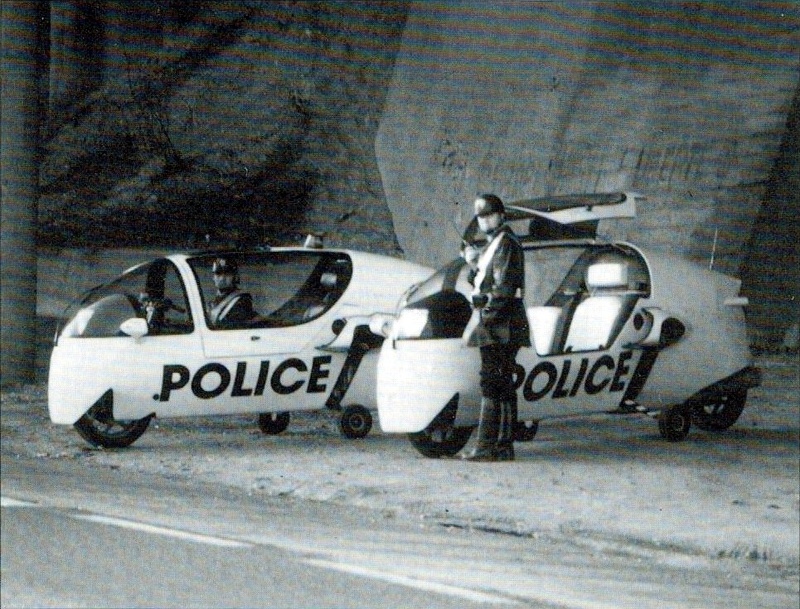 Police EcoMobiles from the 1991 film “Until the End of the World”. This entry was posted in Peraves and tagged AMC ETX, Arnold Schawarzenegger, Colin Farell, EcoMobile, FaceTime, Jessica Biel, Kate Beckinsale, Len Wiseman, MonoTracer MTI-1200, Paul Verhoeven, Police, Sharon Stone, Total Recall 2012, Until the End of the World, Wim Wenders. Bookmark the permalink. Al S., send me your e-mail address and I will keep you posted on U.S. availability of the MonoTracer. When I saw the MonoTracer in the movie I said ” I know what that is”. I remember the EcoMobiles appearing in the second movie.